A common road design problem is the widening and repair of existing road surfaces. In this scenario we wish to fill in the road shoulder and possibly widen the road as well on both sides. To minimize the cost we don't want to change the existing pavement. 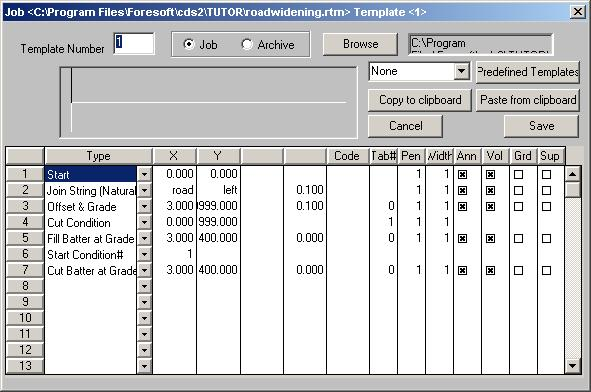 The data will be found in the tutorial directory, the data is supplied in the job 'roadwidening'. center string; in the folder "Section" with id "long"
left edge of the road; in the folder "road" with id "left"
right edge of the road; in the folder "road" with id "right"
The first step is to triangulate and contour the surface and check that what we have adequately represents the existing road and surrounds. If you are unsure of how to do this we suggest that you review the procedure found in earlier tutorials. We need to use these strings as breaklines to stop triangles forming across the existing road surface. The data as supplied has had this done. 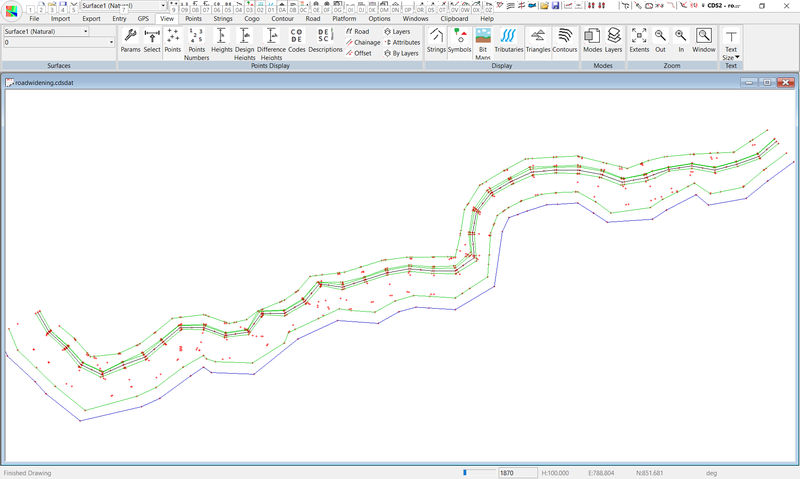 The screen shot below shows a section of the road that has been enlarged. It is suggested that you first pan along the road to check that everything is OK before proceeding. We now need to interpolate some sections from this surface. From the "String" menu use the Select - Single string option to select the existing center line. 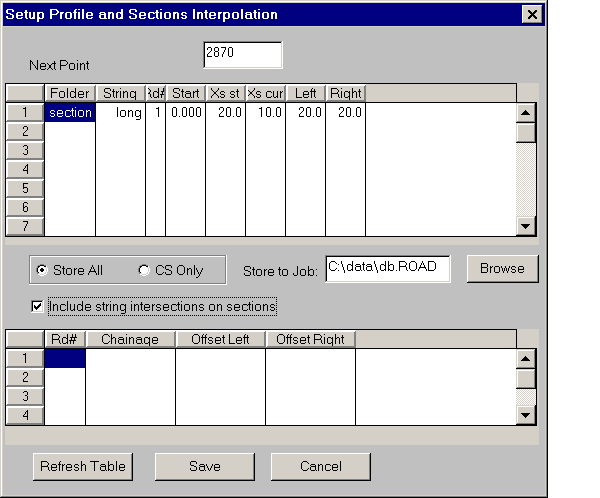 Once you have done this run the "Interpolate Profiles and Sections" from the "Contour" menu. The interpolated points are placed in a separate table separate from the main database. Once you are happy with the sections produced accept them. We are now in a position to start the design process of the job. For the current data we design along this center line profile. 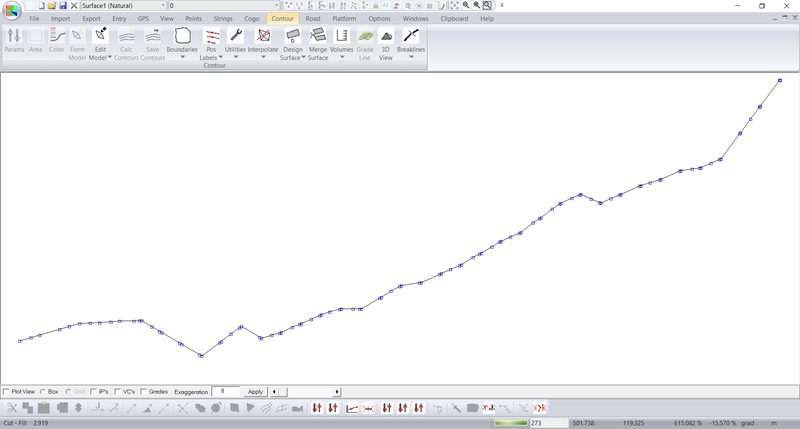 The first step is to tell the program that this is the the profile we wish to use and how it is used. Click on the road parameter button (big green P and fill it in as follows) . We are doing the design using a string and we are designing along the string in Folder section with an ID of long. Summarizing so far. We have created sections along the road. We have extracted the profile of the center of the road. 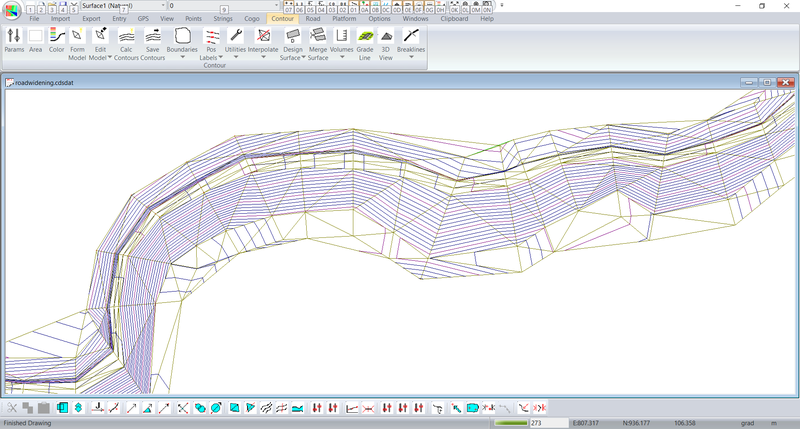 The next step is to define a road template that specifies our design section. We need to create a slightly different template for the right hand side. In this case we create a standard template 2. The only difference is the "Join String (Natural)" command. In this case we wish to join to the right edge of the road defined by the string on Folder road and ID right. The next step is to specify that we are using template 1 on the left and template 2 on the right in our template positioning table. Display one of the sections by clicking on the section icon. It is 16 across from the left on the bottom line of icons. If you right click in the section view you will see the menu item "Template positioning". There will be 2 columns displayed. 1L and 1R which are for left and right respectively of design line 1. Fill in a template of 1 to the left and 2 to the right. You only need to fill in the first line. Once this has been done right clicking on a current entry will fill in the rest of the column with the same number. As we can see the new design runs along the existing surface but comes out until we reach an offset of 3 meters. We then apply the appropriate cut or fill batter. 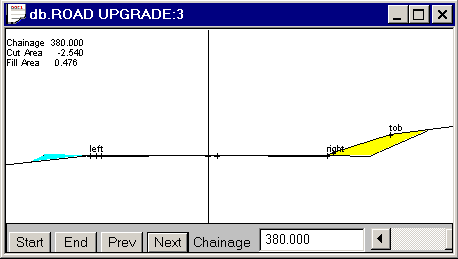 We are now in a position to print/plot/export to dwg a set of cross-sections; and calculate earthwork volumes etc.